Trabzonspor Finally won a match after four weeks...They beat Konyaspor in Trabzon,1-0. Gokdeniz Karadeniz scored a beituful goal in this match. This was the first match for Unal karaman former Turkish junior national team coach, as a coach of Konyaspor. It was very interesting, Unal Karaman played for Trabzonspor many years as a player. FENERBAHCE FINALLY WINS A MATCH AFTER 34 DAYS!.. As I wrote before, this was the turning point match for Fenerbahce.That's why ,they had to win this match . If they would loss this match, they would be way behind the leader of the League. With a win against Ankaragucu who had 11 points before this match was front of Fenerbahce in the Standings. Now, Fenerbahce went infront of Ankaragucu with 12 points. The other reason ,they had to win this match ......they play against strong Vestel Manisaspor next week. That's why this was a needed win, for Fenerbahce before Champions League match in the mid week and weekend match against Fnerbahce killer Giray Bulak and his Vestel Manisaspor. Fenerbahace scored the first goal in the 38th minute by Mehmet Aurelio and second goal came in the final minutes of the match by Ali Bilgin . 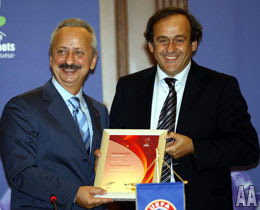 Michel Platini, the President of UEFA and Haluk Ulusoy, the Chairman of Turkish Football Federation (TFF), signed a contract that seals Turkey's membership to Grassroots Charter.The charter, which was created in 2004, represents an endorsement of a national association's grassroots programmes. UEFA's work is about around encouraging and supporting the associations in reinforcing their grassroots activities. Signing the charter means that a national association satisfies certain basic minimum criteria. Associations enter with basic one-star status, and additional stars are given in relation to specific grassroots areas - these include the nurturing of women's and girls' football, social programmes, including disability football, number of participants, and the promotion of grassroots football. Up to seven stars are possible. "Our aim is to reach the highest level in the charter. Our federation qualifies children and teenagers as a potential for the future of Turkish football, and therefore we attach great importance to them. We plan to make best use of this potential," said Haluk Ulusoy after the signature ceremony held at Istanbul's Ciragan Palace. "We also support wheel-chair organizations," he added. "Turkey has become the 21st country signing the Grassroots Charter," stated UEFA General Secretary David Taylor who also attended the ceremony. The UEFA Executive Committee, headed by President Michel Platini, concluded its two-day summit at Cıragan Palace Kempinski in İstanbul on Thursday. According to a press release issued by UEFA at Çırağan shortly after the meeting, the draw for the 2008 European Championship finals will take place in the Swiss city of Lucerne on Dec. 2, 2007. Host nations Switzerland and Austria will be competing in groups A and B while the remaining 14 teams will be divided into four categories. If Greece, the current European champion, makes it to the finals, it will be competing in the first category with the team that has the highest points. The remaining 12 teams will be divided into three categories on the basis of their average points from the 2006 World Cup and the qualifying round for the Euro 2008. The categories of European teams that will join the qualifying round for the 2010 World Cup will be determined according to their FIFA rankings. Fifty-three national teams will compete to be one of the 13 teams that will play at the World Cup in the qualification stage. Meanwhile at his press conference, Platini repeated the policy of zero tolerance toward violence and racism in soccer stadiums and also toward those who engage in such practices. "We can take strong decisions -- if we have to exclude supporters from stadiums or suspend clubs, we will, until the day that we have people in the stadiums who come to watch soccer, not to cause problems." Platini also said he would applaud any referee who, in agreement with the match delegate, decides to stop a game because of racist conduct in stadiums. "Some things are fundamental in life," he explained. "A soccer match is important but there are certain behaviors we cannot tolerate at stadiums." At its meeting on Wednesday and Thursday, the Executive Committee heard a report on the club licensing scheme after four years of implementation. It stressed the necessity of continuing the excellent work that has been done since the scheme was introduced at the start of the 2004-05 season. In the meantime, Platini, replying to questions from the press, explained his popularity in Turkey by recalling that he did not score a single goal against Turkey during his years as a footballer. Platini also said Turkish soccer has come a long way in the past 20 years. “You finished third in the 2002 World Cup and Galatasaray won the UEFA Cup and European Super Cup in 2000. There were great players at that time. This is a problem of generations. The players get old and a new generation has to emerge. UEFA President Michel Platini arrived in Istanbul on Tuesday to chair UEFA Executive Board meeting. Co-chairmen Senes Erzik, Geoffrey Thonson, Angel Maria Villar Llona, Gerhard Mayer-Vorfelder and Marios Lefkaritis, and members Franco Carraro, Viacheslav Koloskov, Gilberto Madail, Joseph Mifsut,Per Ravn Omdal, Mircea Sandu, Mathieu Sprengers ve Gregory Surkis will attend the meeting. UEFA honorary president Lennart Johansson and UEFA SG David Taylor will also attend the meeting. A press conference will be held after the meeting to announce the decisions made at the meeting. The same day, Platini and Turkish soccer(football) Federation Chairman Haluk Ulusoy will sign a contract for Turkey's membership to the Grassroots Charter. Those of you who read my article before the Saturday and Sunday matches, would know I have talked about watching a good soccer matches in both days. Also, I talked about the sleeper team Sivasspor, when Turkish soccer news media never mentioned Sivasspor. When ever Galatasaray plays in Ataturk Olympic Stadium, they struggle!....Kasimpasaspor, really played though against Galatasaray in this match. This was total collapse by Besiktas defense and Goal Keeper. Besiktas came back, first with Chilean player Tello and than Brazilian young player Bobo and Turkish youngster Serdar Kurtulus. Besiktas won the match but, I did not like Besiktas defense and Ertugrul Saglam's attitude about Delgado.... I can not understand why Ertugrul Saglam won't use Delgado!.. Fenerbahce made a lot of noise when they beat Inter-Milan in Istanbul!.. They made a great start in the CL......but, in the Turkish Turcell Super League, Fenerbahce is not doing so great! In Bursa, against Bursaspor they came behind to tie the match. with this draw, Fenerbahce dropped to eight place with 9 points. That is how Bursaspor scored the goal against Fenerbahce. Fenerbahce is seven points out of first place Galatasaray. Kayserispor and Ankaragucu earns the honor mention, showing the consistency in the league.Kayserispor and Ankaraguc both have 11 points. If there is a draw in this derby , Sivasspor could claim the first place if they win their home game against Bursaspor. Hungary captain Zoltan Gera has had his one-game suspension for a red card overturned. Gera received a second yellow card in a European Championship qualifier against Turkey on Sept. 12 for diving, but video replays showed goalkeeper Hakan Arikan had made contact with the midfielder. "It actually should have been (recorded as) a legitimate foul. It should have been a penalty, too," UEFA spokesman Rob Faulkner said Friday. "We can't go back and change that, but we can take the second yellow card away." The Hungarian soccer federation appealed the red card to UEFA after the match, which Turkey won 3-0. "It was self-evident that we have to stand by our truth to the very end and the UEFA decision supports this from all aspects," federation chairman Istvan Kisteleki said in a statement. Faulkner said the decision was taken Thursday at a disciplinary meeting and means Gera will be available to face Malta on Oct. 13 in Hungary's next Euro 2008 qualifier. Hungary lost to Malta 2-1 last year, leading to the resignation of coach Peter Bozsik. After busy week in the European matches, Turkcell Super League matches started on Friday with two matches.In Manisa,Trabzonspor came from behind to salvage a 1-1 draw against Manisaspor in a clash which saw both sides reduced to 10 men. Filip Holosko opened the scoring for the hosts nine minutes after the break, but his joy was short-lived as he saw red shortly afterwards.Trabzonspor failed to capitalise on their numerical advantage and were reduced to 10 themselves when Umut Bulut was given his marching orders just after the hour-mark. But Gokdeniz Karadeniz rescued a point with an equaliser 18 minutes from time. In the only other game ,Ankaragucu moved up to third in the Turkish Turkcell Super League after a dramatic 1-0 win over Istanbul Buyuksehir BSK. The match looked to be heading for a goalless draw until defender Abdullah Sume netted a late winner for the hosts deep into injury time. On the other side, Denizlispor is low in morale as they lost 1-0 against Istanbul team Kasimpasa in last weeks encounter. Saturday's other encounter will be between Kayserispor who will host Ankaraspor and Konyaspor who will host Genclerbirligi. Sunday will be very important for the top place. if Galatasaray upset by Kasimpasa and League's news second place team Sivasspor gets by Caykur Rizespor , they could capture the first place!. FC Sion of Switzerland defeated Galatasaray of Turkey 3-2 in the UEFA Cup first round match in Geneva on Thursday. Fenerbahce made a glorious return to the Champions League on Wednesday night with a hard-fought victory over Internazionale. The Turkish champions, who did not participate in the competition last season, secured victory thanks to Deivid's stunning first-half volley. The Brazilian forward capped a stirring performance by scoring his first goal in Europe's elite competition at the Sukru Saracoglu Stadium. The Italian champions had to do without seven players through injury and suspension for their opening Group G encounter and they struggled against a determined home side. Inter can even count themselves a touch fortunate not to have suffered a more convincing defeat with Nerazzurri keeper Julio Cesar in fine form. It was the Italians who had the first chance of the game early on, however, Zlatan Ibrahimovic firing wide of the near post. The hosts replied with Deivid's powerful header which forced Julio Cesar to palm the ball over the bar. The Nerazzurri surged forward again and could have broken the deadlock midway through the first half had Onder Turaci not got in front of Sweden international Ibrahimovic to clear for a corner. On the half-hour mark, former Inter full-back Roberto Carlos warmed the hands of Julio Cesar with a stinging drive which the keeper palmed over. At the other end, David Suazo missed a golden chance to break the deadlock after Ibrahimovic's pass sliced Fenerbahce's defence wide open and found the Honduran striker but his shot was weak and easily saved by goalkeeper Volkan Demirel. It proved costly for Inter as shortly after, Fenerbahce took the lead. Alex's cross from the right found an unmarked Deivid whose acrobatic volley found the roof of the net, much to the joy of the home fans. Inter were determined to find the equaliser after the re-start and they almost got it, but Ibrahimovic's close-range effort deflected off a defender for a corner. But that is as close as Inter got as Fenerbahce began to move forward with ruthless precision. Roberto Carlos twice had the opportunity to score against his old employers but his powerful free-kick was saved by Julio Cesar while shortly after, his left-footed strike from inside the area hit the post. Inter continued to struggle and they almost conceded a second on 66 minutes, with Alex's diving header being met by a stunning one-handed save by Julio Cesar. With 20 minutes remaining, Hernan Crespo replaced Suazo as the Italians desperately tried to breach Fenerbahce's well-marshalled defence, but despite a late rally they were unable to avoid defeat. Fenerbahce Demirel, Turaci, Lugano, Edu Dracena,Roberto Carlos, Baris, Alex, Aurelio, Wederson,Kezman (Senturk 67), Deivid. Subs Not Used: Babacan, Cakmak, Kazim, Sahin, Boral, Gonul. Inter Milan Julio Cesar, Zanetti, Rivas, Samuel, Maxwell,Stankovic, Dacourt (Jimenez 70), Cambiasso, Solari (Figo 58),Suazo (Crespo 72), Ibrahimovic. Subs Not Used: Toldo, Esposito, Bolzoni, Puccio. Second-half goals by Julien Rodriguez and Djibril Cisse gave Olympique Marseille a 2-0 win over Besiktas in their Champions League Group A opener on Tuesday. Centre back Rodriguez poked the ball home in the 76th minute after a Samir Nasri corner kick hit the far post and France striker Cisse wrapped up the win in injury time to earn the Ligue 1 side their first home victory of the season. Albert Emon's side dominated throughout and were barely bothered by a feeble Besiktas side. Marseille, who won the Champions League in 1993, lead their group after five-times champions Liverpool were held to a 1-1 draw at Porto. 'We're feeling better. The Champions League is such an important competition,' Emon told reporters. Serdar Kurtulus and Ricardinho were both replaced in the first half with suspected injuries following rough tackles. Marseille started brightly, with Senegal striker Mamadou Niang a permanent threat to the Besiktas defence, but proved too clumsy in front of goal. Cisse had the clearest chance in the 11th minute but his attempt was blocked by Hakan Arikan. The Besiktas goalkeeper pulled a superb save seven minutes into the second half when he tipped a Karim Ziani shot over his bar. Marseille next travel to Anfield, where no French club has won, while Besiktas host Porto. Marseille coach Albert Emon knows his job is on the line as he prepares his troops for Tuesday's opening Champions League Group A encounter with Besiktas. OM have made a sluggish start to the new Ligue 1 campaign, with just one win in eight outings leaving them hovering dangerously close to the relegation zone having been touted as title candidates in pre-season. A win against Besiktas would go a long way towards easing the early-season jitters at the Cote d'Azur club, and give Emon some breathing space after club president Pape Diouf hinted that he may ring the changes unless there is an upturn in form. A home defeat to Toulouse at the weekend has dampened spirits yet further in the Marseille camp, but Emon is adamant he is going nowhere. Victory against last season's Turkish Super Lig runners-up would be a huge fillip for the embattled coach, who is determined to enjoy the challenge of Champions League football. 'The Champions League is a party,' Emon told www.om.net. 'The club wanted so much to get there and now here it is. We're preparing well, we fought for 12 hard months last year to get here. 'This Besiktas game could be the moment when we lift our heads again. We'll see how the competition gets under way. It could be a good back door for us in terms of the problems we've been experiencing. However, the former France international believes that Besiktas will be no pushovers, and has called on his team to perform to their best. 'They are a good side with some Brazilians and some very technically talented players,' Emon continued. The OM coach will be boosted by the return to the line up of captain Lorik Cana, who missed the weekend defeat to Toulouse through suspension. Besiktas coach Ertugrul Saglam has named a 21-man travelling party for the first leg at the Stade Velodrome, which includes experienced goalkeeper Rustu Recber, a summer signing from city rivals Fenerbahce. The Istanbul outfit, who are competing in the Champions League for the first time in four seasons, will be without the suspended Ali Tandogan and the injured Gokhan Zan. UEFA Executive Committe is going to gather in İstanbul on 26 and 27 September. Turkish Football Federation will host the 2 day event that take place in Çırağan Palace. UEFA President Michel Platini, Vicepresidents Şenes Erzik, Geoffrey Thompson, Angel Maria Villar Llona, Gerhard Mayer-Vorfelder and Marios N Lefkaritis, committee members Dr. Franco Carraro, Dr. Viacheslav Koloskov, Dr. Gilberto Madail, Dr. Joseph Mifsud, Per Ravn Omdal, Mircea Sandu, Drs. Mathieu Sprengers and Gregory Surkis will participate the meeting. UEFA Honorary President Lennart Johansson and UEFA General Secretary David Taylor will also be present. The meeting will start on 26 September at 14.00. On 27 September by noon the meeting will end and there will be a press conference at 12.15. At 14.00 o'clock UEFA and Turkish Football Federation will sign for Turkey's Grassroots Charter membership. Emre apologizes for press box hand gesture but, apology did not excepted by Turkish media! Newcastle United midfielder Emre has issued a public apology after a launching a furious tirade at the Turkish media. The 27-year-old made hand gestures and shouted towards the press box after his country's first goal in their 3-0 Euro 2008 qualifier victory over Hungary in Istanbul on Wednesday evening. 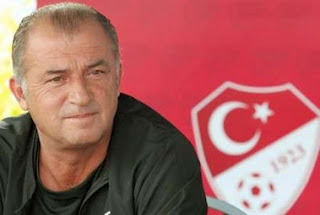 Reports from Turkey suggest he had been angered by criticism of national coach Fatih Terim following the 2-2 draw with Malta, as well as stories linking him with a move back to Galatasaray. The former Inter Milan star returned to Tyneside with a knee injury which is likely to keep him out of Monday night's Premier League trip to Derby. We all saw how the National team played 67 minutes!....on the side line Fatih Terim and his gang was sweating like hell!..... In the 63th minute , referee of the match , Stuart Duagal , made a bad call in my opinion and send off Gera, with second yellow card for faken falling down. We have to be realistic!.....if Hungary team didn't go down with a man down, the score would not be three zip!...... But, win is a win, this is not mean , Tukish National team, still back on winning record! Scorers: Turkey - Gokhan Unal 69 min., Mehmet Aurelio 73 min., Halil Altintop 90 min. Red Card: Hungary - Zoltan Gera 63 min. Ladies and Gents, look where we are now!.... Third place in the Group C and almost lost to Malta... a little island Country with a population of four hundred thousand. "After watching Turkey in recent outings, I noticed there was something wrong in their defence. That's why I planned to focus on counter-attacks." "I had told the players that if we were to score first, we would not lose. In such games, our opponents always panic,"
Malta v Turkey Live Online..
Malta v Turkey match will be broadcast online by JumpTV.